Iraqi government forces have battled their way into another suburb of Mosul, the northern city held for more two years by the Islamic State (IS) group. Troops broke through IS defences and reached the eastern district of al-Zahra, which they say is now 90% under their control. Special forces have been fighting the jihadists in the streets and alleys. Meanwhile, the UN says there is growing evidence of IS atrocities in and around Mosul. It has already expressed concern for the estimated 1.5 million civilians living in the city amid reports of mass killings and people being rounded up for use as human shields. How IS sells the battle for Mosul? In another development on Friday, the first convoy of vehicles carrying hundreds of civilians fleeing the fighting around Mosul arrived at a camp east of the city. The BBC's Karen Allen, who is at the camp, said many had not left their villages since IS took over more than two years ago. Government and Kurdish forces began a US-backed offensive on 17 October to drive out the jihadists. They have already retaken dozens of villages and towns in the surrounding area. Troops from the Counter-Terrorism Service began their push towards al-Zahra, formerly known as Saddam district, at 07:00 (04:00 GMT), advancing rapidly after breaking down IS defences, said BBC Arabic's Feras Kilani, who is with the elite force. Inside al-Zahra, militants continued to fight back and a coalition air strike was ordered to destroy an IS position. There were no civilians to be seen but commanders repeatedly instructed troops via walkie-talkies to spare them any harm. A military spokesman said IS was putting up stiff resistance. "The battle is currently going on, the enemy is using snipers, car bombs and directed missiles," said Lt Gen Abdel-Wahab al-Saadi. "God willing, we will return fire and will liberate the neighbourhood (of al-Zahra) soon." Residents who spoke to our correspondent said IS had been expecting the attack and had withdrawn two days earlier, leaving behind four pockets of resistance to slow down the government advance. Iraqi forces trying to enter another Mosul suburb - Karama, south of al-Zahra - had to partially pull back when IS launched fierce resistance. "We weren't expecting such resistance. They had blocked all the roads," said one officer, quoted by AFP news agency. "There are large numbers of jihadists. It was preferable to pull back and devise a new plan." 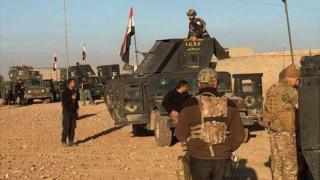 There were also fierce clashes in the nearby district of Intisar on Friday and Iraqi forces said most of it was now under government control. The UN human rights office (UNHCR) provided more evidence on Friday of human rights violations taking place in and around Mosul. It said that IS had shot around 50 of its own fighters for desertion on Monday and added that 180 government employees may also have been killed by the group. 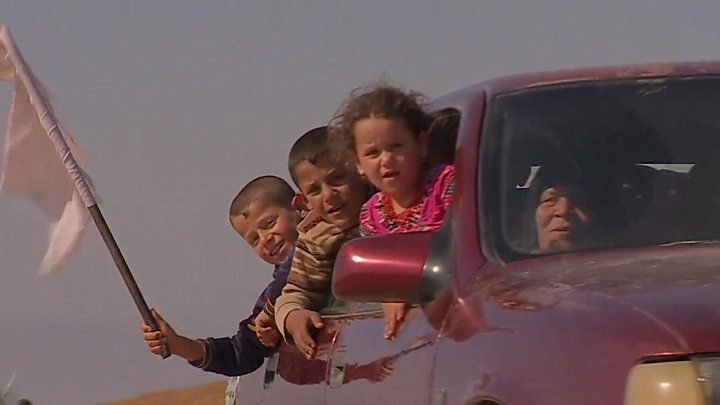 UNHCR spokeswoman Ravina Shamdasani said that more than 1,000 civilians were reportedly taken from the town of Hamam al-Alil to Tal Afar, possibly for use as human shields, and families in Hamam al-Alil were told to hand over children, especially boys over the age of nine, in an apparent attempt to recruit them as child soldiers. "Apparently they have also been using loudspeakers mounted on the back of pick-up trucks or at the back of vehicles, and threatening severe punishment for families that do not comply with their order," she said. A contingent of 200 Iranian Kurdish women fighters have joined the fight against IS around Mosul, Reuters news agency reports. They are now part of a larger unit of some 600 fighters aligned to the Kurdistan Freedom Party. "We are working hand in hand with the men who are fighting, our brothers, we fight together and co-operate with each other," said one of the women, Karin. "We work together to protect our land from any threats it might face."